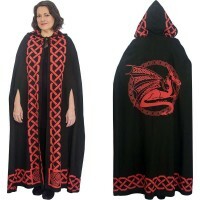 This black hooded cloak with green Celtic knotwork is perfect for costume or ritual use with tie front. This lightweight black cotton cloak is roomy enough to completely cover your body with arm slits for easy access. It has a traditional green Celtic knot on the back with large green Celtic border running along the hood and hem. Tie front closure. 100% cotton, unlined cloak is 52 inches long. One size fits all. Unisex. Item Number: KK-59715 | Approximate Size (Inches): 8.00 wide x 10.00 deep x 52.00 high | Approximate Shipping Weight: 2.00 lbs.